Junggugeo Kaenada 중국어 캐나다: Since our last K-Drama Watching post, I suffered a bit of a viewing drought. Other than “Twenty Again”, I could not find any show that I wanted to watch. Then, I burned through half of “My Love Eun Dong”. It was a very prolonged story of repeatedly thwarted love. The lead couple first met as children, then reunite in their early 20s, and finally find each other as thirty-something year old adults. Only 만: I’m having the same problem. I finished off “Last”, caught two more episodes of “Padam Padam”, and now I’m just watching “Twenty Again”. 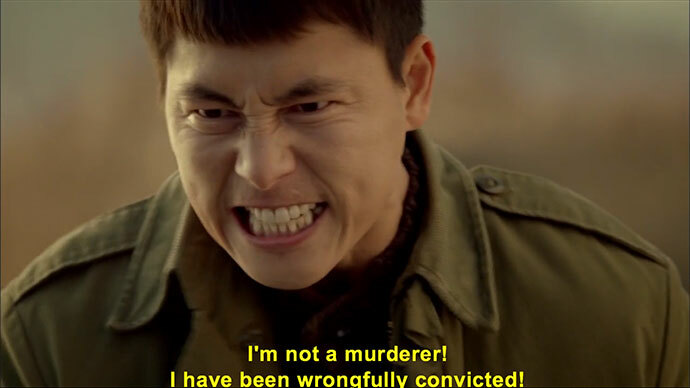 You said you only binge watched half of “My Love Eun Dong”. Did you give up after that or are you still going strong? Junggugeo Kaenada: I gave up in favour of skimming recaps just to sate my curiosity. As in, I didn’t even read; I just looked at the photos and it was obvious what happened. Even then, it took too long. The first episode concentrated on the lead couple’s childhood, and the second episode was about their reunion as young adults. From the third episode onward, it was Joo Jin Mo and Kim Sa Rang. The beautiful lighting and attractive leads really kept my interest far longer than the show had any right to. However, it became apparent that the two actors had no sexual chemistry. This was especially unfortunate, because their young adult version, played by Baek Sung Hyun and Yoon So Hee, managed to convey palpable sexual desire in a single episode. Only: I only know Baek Sung Hyun from Blades of Blood where he was hampered by a terrible mustache, so I’m surprised to hear he can generate heat. Too bad the adult incarnations didn’t live up to it. Surprisingly, I’m having the same problem with “Padam Padam”, which has a lot of heartfelt weeping, but little heat between the leads. And, given how the balance has shifted from frequent shirt removal to frequent teary speeches, I’m beginning to lose interest. Junggugeo Kaenada: I know how non-stop waterworks forced you to quit “Angel Eyes”. Only: Yes, and that was in spite of Lee Sang Yoon’s dimples. Still, the pull of Jung Woo Sung’s abs is considerable. I’ll probably finish “Padam Padam”, though I may have to forward through the weeping. Junggugeo Kaenada: Admittedly, I gave up on “Padam Padam” after the first episode, so your commitment to Jung Woo Sung’s abs is considerable. You mentioned that you finished “Last”. How was that? Only: I’m just not cut out for revenge dramas. It wasn’t bad, but I can’t say I ever got emotionally involved with the leads, though Lee Bum Soo did make a pretty decent villain. But, I only enjoyed it when Tae Ho (Yoon Kye Sang) and his gang were planning elaborate capers, and pulling them off. When it came time for dramatics and extended brawls, my interest waned. Junggugeo Kaenada: Maybe it just wasn’t very well done. For instance, I enjoyed the revenge-driven plot of “Bad Guy” for the most part. Only: Maybe I just had trouble buying into Tae Ho’s need for revenge, because I didn’t care about the character. He was an arrogant jerk, then he was a nice guy being used by bad people, then he was an arrogant jerk again, and then he went back to being a good guy. It seemed pretty random, and the character was barely fleshed out past that point. Plus, it felt a little predictable. It was easy to guess from the first episode who was going to die, and I was right on all counts. Junggugeo Kaenada: So, I have only watched episode 7 of “Twenty Again”. 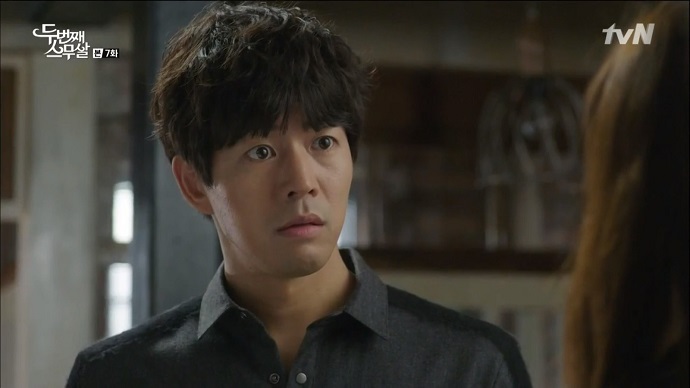 Did you enjoy how insane Hyun Suk (Lee Sang Yoon) was? Surprisingly, I did, because it brought out the worst in No Ra (Choi Ji Woo), and the two of them entertained me by acting like petty children towards each other. Only: I enjoyed the insanity, though it did make me dislike Hyun Suk. I was flabbergasted when he suddenly went back to being a jerk to No Ra. Though, one thing that I’ve consistently liked about Hyun Suk is that he genuinely wants No Ra to find her backbone, which is kind of nice. Junggugeo Kaenada: Do you have any comment about episode 8? I’ll avert my eyes until I’ve seen it for myself. Only: I dislike Hyun Suk somewhat less after episode 8. At least he broke out of the pattern of acting like a bratty high schooler around No Ra. 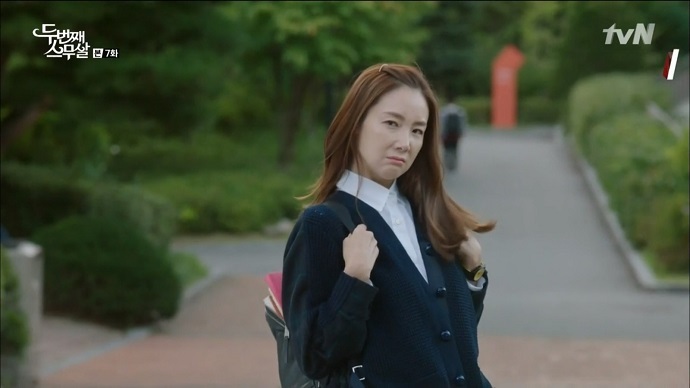 Also, Choi Ji Woo can’t dance. There, I said it. Readers: what have you been watching?